As some of you know, the Scholars’ Lab has a spiffy 3D printer, a Makerbot Replicator 2. We’ve had fun with it, printing all sorts of wonderful things. As time went on and we continued using it, we ran into a problem plenty of other folks encountered, where the plunger that pushes filament against the drive gear was weakening. The first solution we tried was tightening up the plunger, but we’d have to do this frequently. 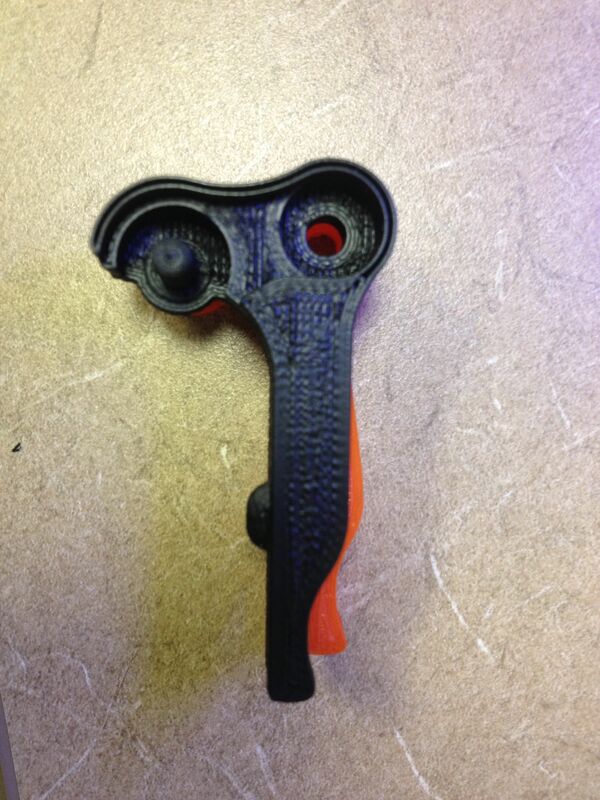 A better solution was to print a new set of parts—a spring-loaded arm and mount—to replace the plunger. So I ordered up the hardware I’d need (spring, bearing, and bolts), and when those arrived in the mail, I printed the arm and other parts, disassembled the drive block on the printer, and replaced the plunger with new spring-loaded arm. 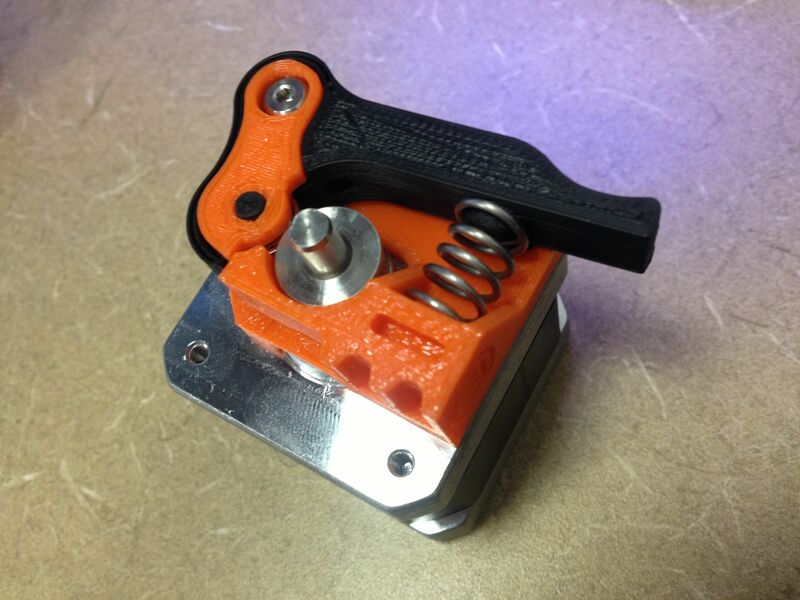 You can see the fully-assembled drive block in my made stuff on Thingiverse. After I put the drive block back on the printer, I could tell an immediate difference in the prints. The plastic was extruding more smoothly than before. Loading the filament was a tiny bit trickier, but well worth it. Then last month, I hauled the printer halfway across the country to use in a workshop on 3D modeling and printing at the Digital Humanities conference in Lincoln, Nebraska. When I started a test print to calibrate the printer, I noticed the printer wasn’t extruding plastic as well as it had been. so I took the drive block off again, and noticed the arm was loose, that the spring wasn’t actually pushing up on it enough to exert pressure on the filament coming it. I assumed I had just cracked the arm somehow during the drive out to Nebraska, so I just stretched the spring out a bit so it would better push the arm up, and went on with the workshop as planned. Comparing printed arms for the drive block. The black arm is the replacement, and the orange arm is the old one. Upon further inspection, the old one isn’t broken as I had first suspected. Comparing the two (The orange arm is the first one I printed, and the black arm is the replacement I just printed) , it looks like the orange one has warped, very likely due the plastic arm being so close to the heated extruder. It could also be that the spring was strong enough to warp the plastic arm bit by bit over time. I’m sure the proximity to the heated extruder helped with that too. Assembled drive block with spring-loaded arm. I decided to go ahead and use the newly printed arm for now. Needless to say, if you’ve tried this solution for your Replicator 2, you’ll be better off long-term sending for the machined replacement parts as I did. But for now, the new arm is working great, and should hold us over until the machined parts arrive. Cite this post: Jeremy Boggs. “Reprinting Printed Parts”. Published August 14, 2013. https://scholarslab.lib.virginia.edu/blog/reprinting-printed-parts/. Accessed on .